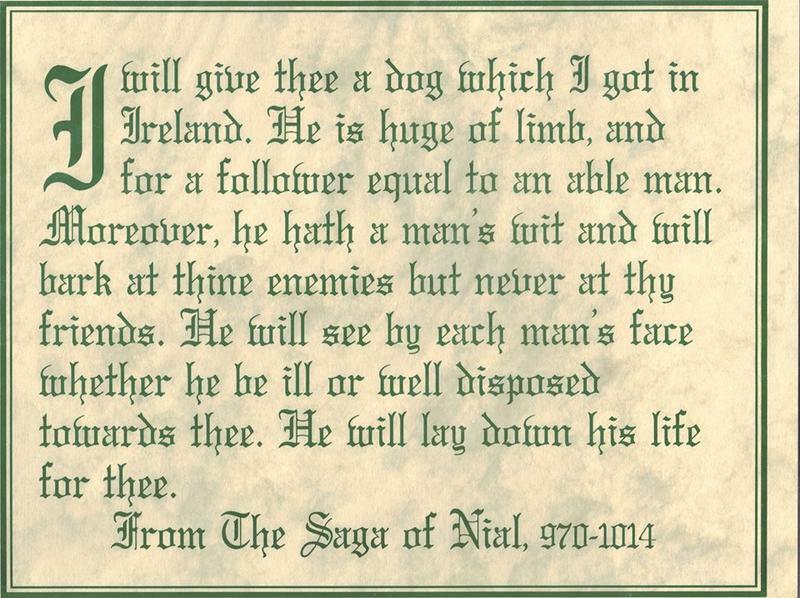 then stationed in Britain, thanked him for the seven Irish hounds sent previously. have been imposing figures even then. From Irelands heroic age of 200 B.C. to 200 A.D., magnificent tales of these dogs abound. From other written records of the fifth century, we know that dog breeding in Ireland was so organized and the dogs so valued that merchants sold them abroad by the shipload! 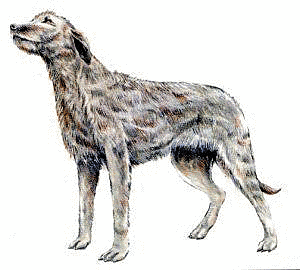 At least the majority of the dogs to be sold were of the wolfhound type, and these Irish cargos may have contributed to the development of many breeds in Europe. A long Icelandic saga of the 13th century sets a dog in the prominent role. 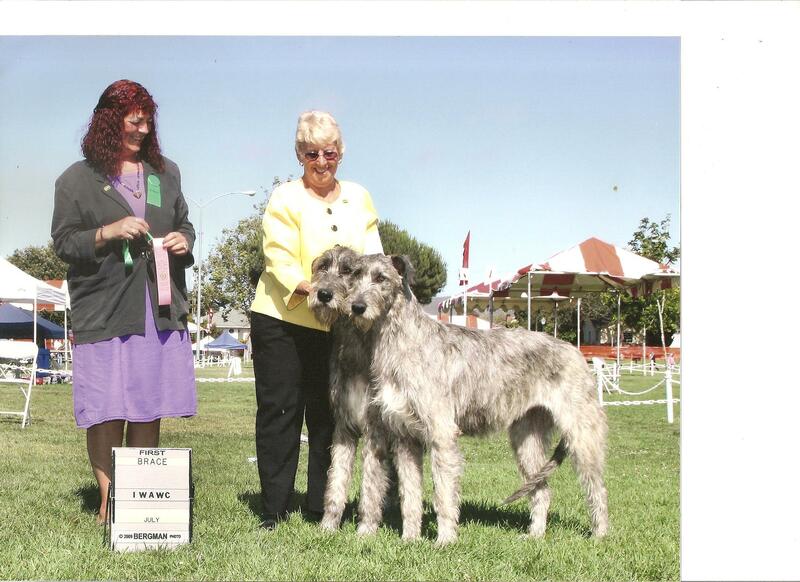 In the 1100s, it was reported that the King of Ulster offered 4,000 cows for a coveted Irish Wolfhound. When the offer for Aibe was refused, it started a war. One of the principals, Gunner, received an Irish Wolfhound as a gift from a friend, who said, "He is a big animal and will make as good a comrade-in-arms as a powerful man. He has human intelligence and will bark at every man he recognizes as your enemy, but never at your friends; he can tell from a mans face whether he means you well or not. He would lay down his life rather than fail you. His name is Samr." From the medieval chores of battle, guarding, and hunting boar, stag and the long extinct Irish elk (which stood six feet high at the shoulders), the Wolfhound gradually turned to the specialized hunting of wolves by the 15th and 16th century. It was during this time that they became more consistent in type and more like the wolfhound of today. By the mid-1600s, Cromwell decreed the exporting of Wolfhounds to be illegal because wolves were still a major problem on the British Isles and the great hounds were not plentiful. The last wolf was killed in Ireland before 1800 and within 50 years, the great hounds, having lost their purpose were reduced to low numbers. The Great Irish Famine of the 1840s also took its toll on the large dogs. In the later half of the 1800s, Captain G A. Graham made the restoration of his ancient Irish breed his lifes work. With careful selection and occasional outcrosses, he re-created the old type. It bred true and was on the road to recovery in the 1870s. The first breed club was formed in 1885. The qualities of great size, heart, loyalty to master, strength and speed were universal and became legendary. Today, the breed is admired and owned around the world, still prized for its gentleness and unswerving loyalty. Although impressive in size, the wolfhound is not a macho guard dog. The nickname, The Gentle Giant fits him well. His size precludes him from becoming a common pet. The physical and financial requirements of an animal this size, limit his ownership to those strongly committed to the breed. The relatively short life span is another drawback for some. 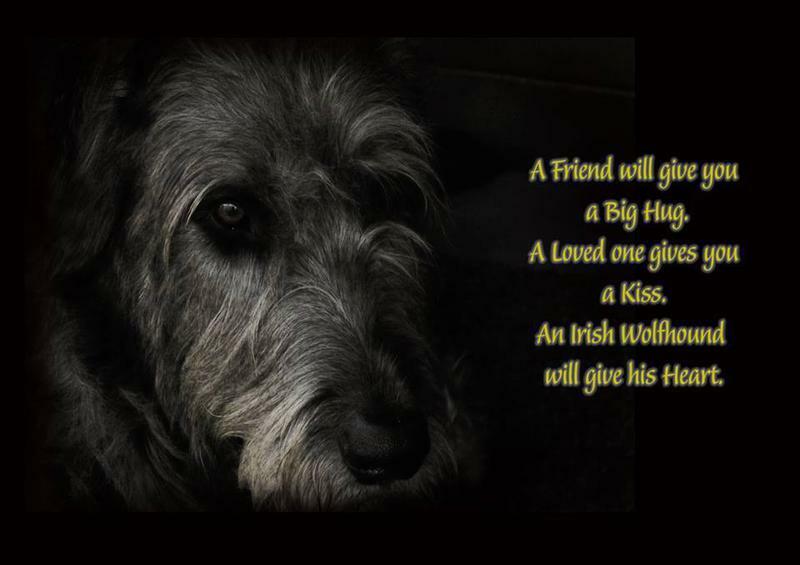 But those who do choose to share their home with an Irish Wolfhound find a loyal, sensitive companion beyond compare. Your frame has been heralded And hailed from afar. You've won kingly praises And knightly award. At the roar of your challenge The timber wolf flees. With my child by the fire.